India on Monday condoled the loss of lives in a Bangladesh airline’s crash in Nepal’s capital Kathmandu and offered any assistance required. “External Affairs Minister spoke to her Bangladesh counterpart and expressed deepest condolences and sympathies for the loss of lives in the crash of the US-Bangla Airlines in Kathmandu,” Ministry of External Affairs spokesperson Raveesh Kumar tweeted. Kumar said Sushma Swaraj “offered any assistance required in Kathmandu, and shared thoughts and prayers for those injured”. As many as 49 persons were killed and 22 injured when a passenger plane of the US-Bangla Airlines, flying to Kathmandu from Dhaka, with 71 on board crash-landed and exploded into a ball of flame at Nepal’s main airport on Monday. Nepal Police spokesperson Manoj Neupane confirmed the death toll. 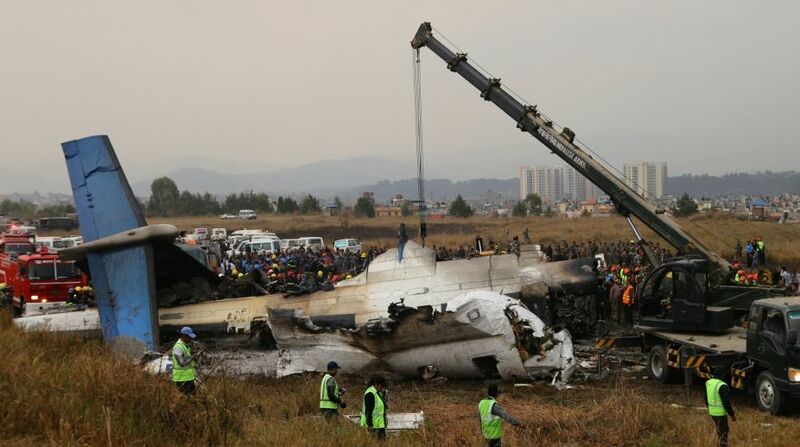 The 78-seater Bombardier Dash 8 aircraft caught fire after it skidded off the runway at the Tribhuvan International Airport (TIA) while landing and crashed onto a field apparently due to technical glitches. Of the 71 people, four were crew members, 33 were Nepalis, 32 Bangladeshis, one Chinese and one Maldivian national, said TIA spokesperson Prem Nath Thakur.